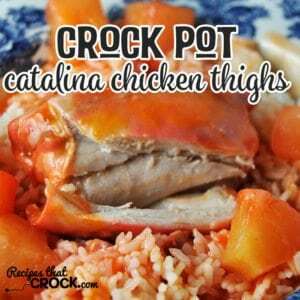 Crock Pot Catalina Chicken Thighs - Recipes That Crock! Life is go, go, go sometimes. 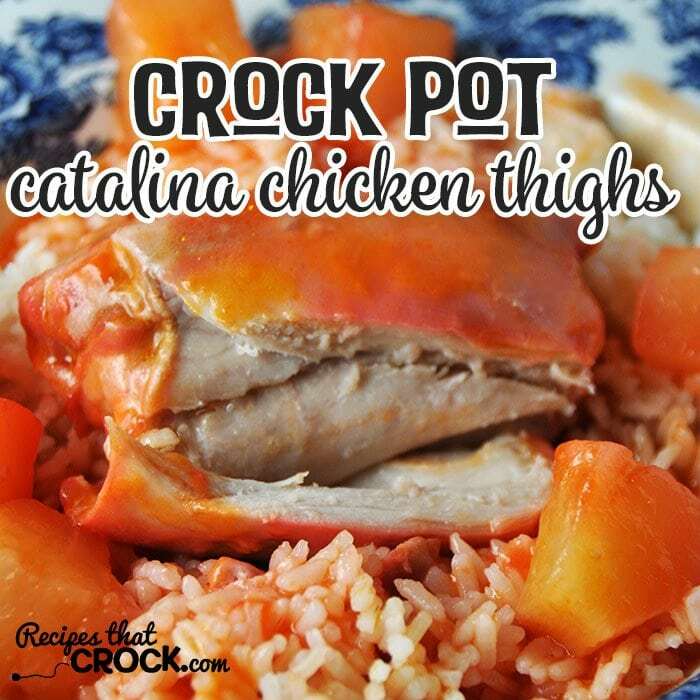 When you find yourself having one of those weeks, Crock Pot Catalina Chicken Thighs will come to your rescue! This recipe is one you can throw together in now time flat. If you want to put it together after you get home from work, you can even throw it together on a day when you are super tired…then turn it on high and put up your feet for the next hour and a half. When you go into your kitchen, the amazing smells of Crock Pot Catalina Chicken Thighs will greet you. Yum! If your grocery store doesn’t have Catalina dressing, never fear! You can pick up some California French dressing instead. It will work great as well! If you need more than 3-4 servings, feel free to double or triple up this recipe. You will just need to adjust the size of your crock pot and your cooking time. Speaking of the size of your crock pot, for the recipe below I used my 2.5 quart crock pot. You can use your favorite 2.5-3 quart crock pot. If you double the recipe, you can bump up the size of your crock pot…just make sure your chicken is completely covered. I made almost this exact same recipe when I first started using my slow cookers and over cooked it incredibly. The flavor was good, but the chicken was dried out. So now that I have a couple hundred slow cooking recipes under my belt, I thought I’d try it again. I used chicken thighs since dark meat is generally juicier, and I drastically cut the cook time. The result? Perfection! With the shortened cooking time, the outside of the chicken is more of a pink than a red. Be sure and use your meat thermometer so you know when your chicken has reached the perfect internal temperature. Can I use drumsticks instead of thighs? Also, I make this sauce with apricot preserves instead of pineapple and it’s delicious. I have not tried it yet, but I think so. You will need to adjust your cooking time a bit to make up for the bones and the smaller pieces of meat. Be sure and use a meat thermometer to achieve the perfect internal temperature and juiciness! Enjoy! Take me back to my childhood with Kraft Catalina® Dressing! Perfect! I hope you enjoy as much as we do! Sounds delightful. Would it be ok to use skinless bone-in thighs? Would I need to adjust the time? Thanks. I haven’t tried it, but I think it would work. You are correct, you will need to adjust the time a bit. Be sure and use a meat thermometer to make sure they are done, but not overcooked. Enjoy! 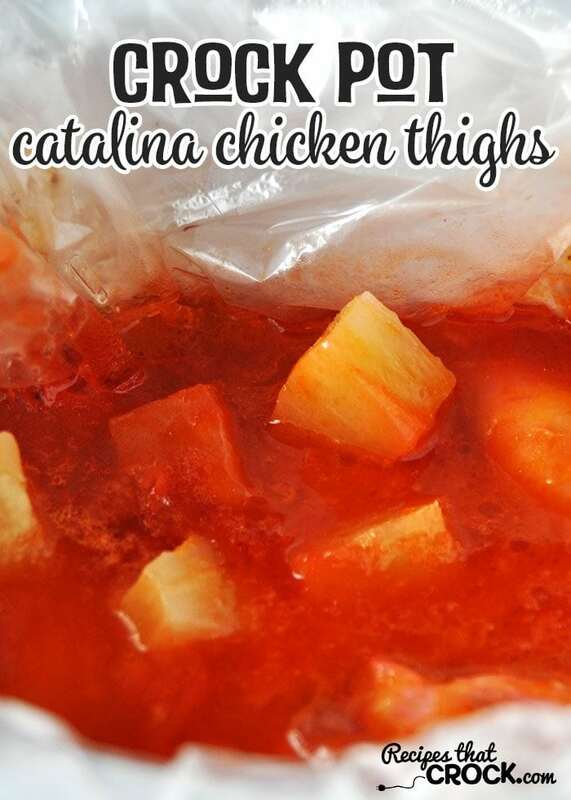 Have you tried this with chicken breasts? The hubby doesn’t like dark meat of chicken. I found the Mississippi chicken did quite well with breasts. I have not tried it with chicken breasts with the shorter cooking time. I think it would work though. You will just need to adjust your cooking time slightly to allow for the larger pieces of meat. Use a meat thermometer so you can make sure the internal temperature is just right. You definitely don’t want to undercook it, but also don’t want to dry out your chicken breast. I hope this helps! Enjoy!